If you find that your meals could use an extra layer of flavor, herbal compound butter can come to your aid. Compound butter is a simple addition to a meal and can take your food’s perceived sophistication up a considerable notch. It is a fantastic compliment to veggies, meat, fish, and breads. Feel free to get creative with your herb choices if chives don’t appeal to you. Keep in mind that you want to scale back on the amount of herbs used if you are incorporating stronger fresh herbs such as oregano or rosemary. 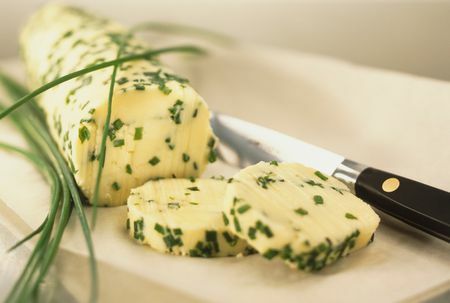 Allow butter to soften, then use a mixer or potato masher to stir in the chives, garlic, and lemon juice (optional). Evenly incorporate all ingredients. Spread out a large (12" or larger) square of plastic wrap or waxed paper. Scoop the butter onto the plastic or paper. Work the butter into a log shape and wrap it tightly.